Mumbai 10th October:Young Social Innovators Conclave 2014, India’s eagerly awaited youth event, remained the ultimate confluence of ideas, inspirations and innovations. A joint initiative by NarotamSekhsaria Foundation, UN-Habitat and University of Mumbai’s Sir JJ College of Architecture, the conclavefacilitated bright young social innovators, working on models of urbanisation, to meet and interact with field experts. 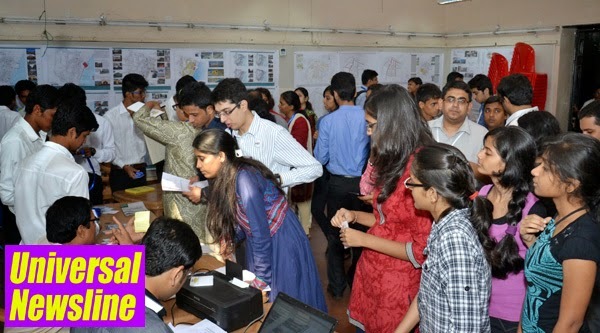 The two-day-long event was organised at University of Mumbai’s Sir JJ College of Architecture, on October 10th and 11th October, 2014. India’s largest innovation exchange programmeprovided an excellent opportunity to propose and discuss cutting-edgeinitiatives, solutions, experiences and challenges in urban development through interactive workshops and presentations. The event covered nine thematic areasgender equalityand empowerment, health, livelihoods, urban planning, governance,environment and climate change, art and culture, education, and sports.Youth-led developments across the country were acknowledged through India Youth Fund Awards. > Launch a network of young social innovators, technical experts, UN agencies, Government and academic institutions to facilitate dialogue on youth led development. >Support programmes which encourage greater participation of youth in the development programs and processes. >To support action and research on issues impacting the lives of youth in the country”. Speakers at the conclave comprised a dazzling array of experts as Dr. NachiketMor- president ICICI Foundation,PadminiSomani-Director NarotamSekhsaria Foundation, Kavita Ramdas, India, Nepal and Sri Lanka Representative, Ford FoundationAnshulTewari, Founder and Editor-in-chief, Youth Ki Awaaz. The second day saw panelists as Ravi Karkara- Global Advisor Youth UN-Habitat New York, MilindaRajpaksha- Co chair of the International Youth Task Force World Conference on Youth Sri Lanka, Lysa John- Ex Director Outreach High Level Panel on Chair, Douglas Ragan- Unit Leader UN-Habitat Nairobi among others. Areas covered on this day includedEducation, Sports, Health, Livelihoods, Governance and Urban Planning. Workshops on Crowdfunding by Wishberry and a workshop on Ecological Footprint by Jyotsna were also conducted. An idea to empower each individual with all the healthcare information Freemium Health, an online web portal, works towards providing an all India Healthcare directory. Talking about the importance of health and hygiene among women, Healthera provides machinery to produce low cost sanitary napkins for small-scale entrepreneurs. This model talked about a sincere effort towards waste management and even recycling. The concept talked about using technology to curb human trafficking. Established in the year 2002, the NarotamSekhsaria Foundation is a non-profit initiative created to support enterprising individuals and innovative organisations. The Foundation believes in building the skills and capabilities of people and communities, to deliver a sustainable and lasting impact on society. To this end, the Foundation partners with charitable and philanthropic initiatives and developmental enterprises, by funding and mentoring programmes that enable better access to healthcare, governance, education, livelihood and art and culture. The United Nations Human Settlements Programme, UN-Habitat, is the United Nations agency that promotes socially and environmentally sustainable towns and cities with the goal of providing adequate shelter for all. UN-Habitat's programmes are designed to help policy-makers and local communities get to grips with human settlements and urban issues and find workable, lasting solutions. The India Youth Fund is a partnership between UN-Habitat and the NarotamSekhsaria Foundation. The Fund aims to assist youth-led organisations in designing and implementing projects that will contribute to sustainable urbanisation in India. Furthermore, it seeks to gain insight from successful grassroots youth projects and create greater awareness of the need for youth mainstreaming in development policies and strategies. The overarching objective of the Fund is to increase the opportunities of urban young people in India to improve the living conditions for themselves and their communities.